WITI's Annual Silicon Valley Conference Returns to the Hyatt Regency Santa Clara, CA - October 6-10, 2008! What do you tell yourself when something doesn't work out the way you had hoped? Do you blame someone else - their attitude or their actions? Do you blame your environment, your upbringing, or fate? If you want to dramatically boost your sense of personal power and self esteem placing blame won't help you. What will help is when you learn to "own your space." Here's why and how. November 6, 2007 • Boca Raton, FL • Register Now! Join WITI and IBM on Nov. 6, 2007 to understand how Web 2.0 technologies can revolutionize your collaborative processes and environments! The presenter and subject matter expert is Marie Manchesi, BP Middleware Executive Strategist, who specializes in advising clients and business partners on the powers of innovation that WPLC technologies offer as social and collaborative software. 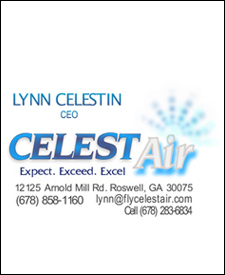 Superior air transportation, customized to meet the needs of individual (especially women), customers. We utilize smaller regional airports where you do not wait in lines, or pay to park. Up to 6 travelers can bring their luggage, laptops, and meals aboard and we can make multiple stops if desired. You Are Your Most Improtant Asset! The Government Will Give You a Tax Break for Protecting That Asset! You don't need to be told that developing a successful business is a major challenge. What you do need to be reminded of is that you are the most important asset of your business. You are the motor that gets everyone running and the mechanic that solves the problems as they arise. You come to work if you're not feeling well; you work overtime and carry your work home with you. True? Remember, you are your business' most important asset. For your business' sake, take care of yourself and protect your family.